Guardians of the Galaxy was an awesome movie. Minimates are one of the greatest toylines of all time. These are indisputable facts. Sorry if you disagree, but that’s just how it is. So, the combination of these two things can be nothing if not amazing! The Guardians of the Galaxy Minimates are a subset of Diamond Select Toys’ flagship Marvel Minimates line. Their just starting to hit stores, starting with the Toys R Us assortment. Today, I’ll be looking at Yondu and the Sakaar Trooper. 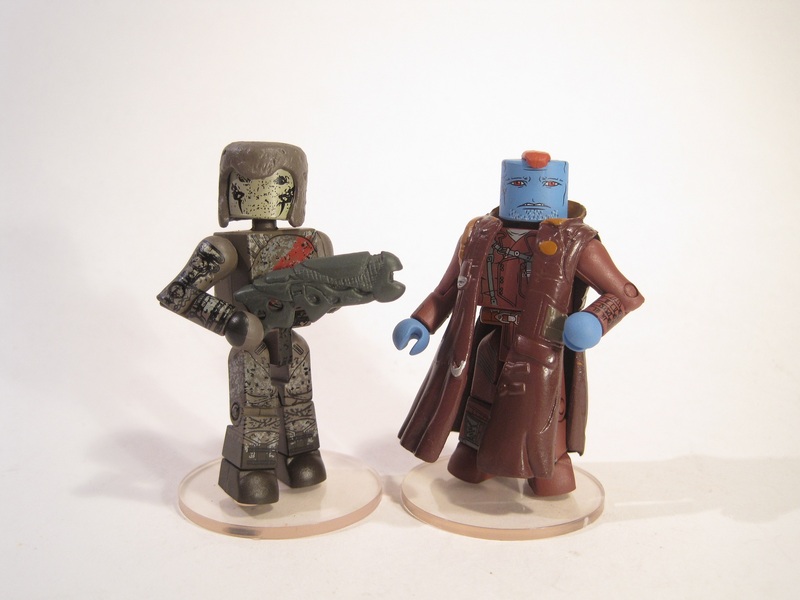 Yondu and the Sakaar Trooper are the exclusive set from the TRU assortment of Guardians of the Galaxy Minimates. The Sakaar Trooper will also be packed with Nebula in Marvel Minimates Series 57, making Yondu the only true TRU exclusive. 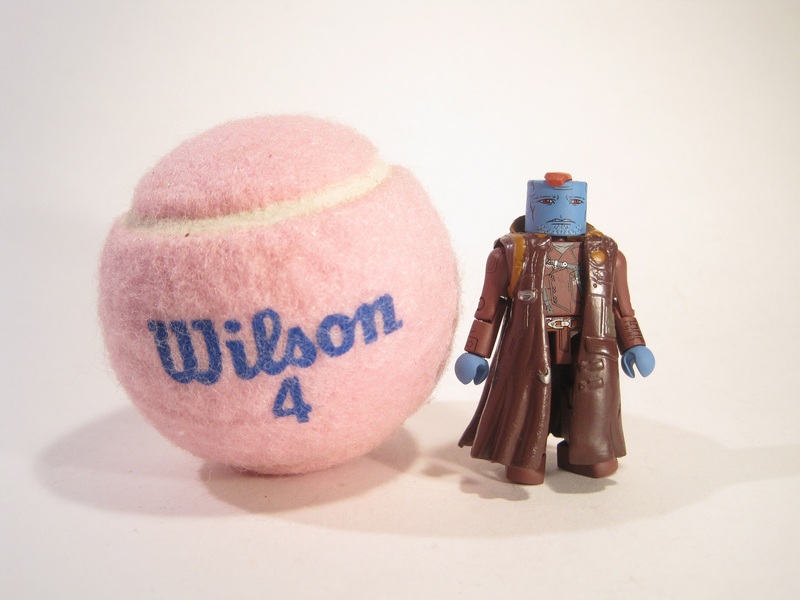 Yondu holds the honor of being the only of the original Guardians of the Galaxy to appear in the film. He also ended up being the character that had perhaps the most changes made to him. I guess the world just wasn’t ready for a blue-skined 30th century archer who sports a 2 foot red mohawk and spandex. And that’s a shame. 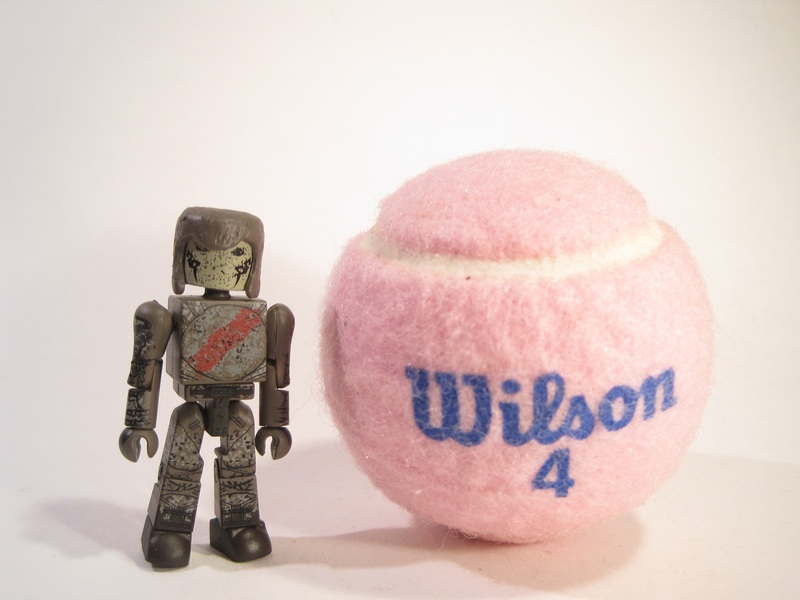 The Minimate is of course based on the film version of the character. The figure is about 2 ½ inches tall and features 14 points of articulation. He uses the standard Minimate body, with all new pieces for Yondu’s “mohawk” and scavenger jacket. Both pieces are well sculpted and look accurate to the source material. Perhaps the details on the jacket could be a bit sharper, but that feels a bit nit-picky. The painted details on Yondu are top-notch. Even with blue skin and red eyes, that’s definitely Michael Rooker’s face. Yondu’s uniform is also quite impressive. There’s tons of folds, straps, pouches and zippers present, which really helps the figure convey the “scavenger” look. The Mohawk piece is red, which isn’t quite right to the movie, where it was a silver piece that glowed red, but I actually prefer the red. Yondu’s only accessory is a clear display stand. It’s a little disappointing that he didn’t get any of his little console doodads, or at the very least his golden arrow, but I suppose the line has to be drawn somewhere. The Sakaar are yet another alien race elevated to movie-dom thanks to Marvel Studios not having the rights to all the top-notch aliens. They and the Chitari must just laugh it up every time the Skrulls and the Baddoon stop by! The Sakaar Trooper stands 2 ½ inches tall and features 14 points of articulation. The Sakaar Trooper is built on the base Minimate body, with the addition of a newly sculpted helmet. The helmet is a decent piece. It has the look of a rough sculpt, but that’s pretty accurate to the look of the Sakaar from the movie. The rest of the figure’s details are handled via painted details. They’ve done a pretty great job of boiling down the rather complex Sakaar design into a basic set of painted details. Like Groot, the Sakaar Trooper features some rather extensive texture detailing that wraps around many of the surfaces. The Sakaar Trooper includes a blaster and a clear display stand.